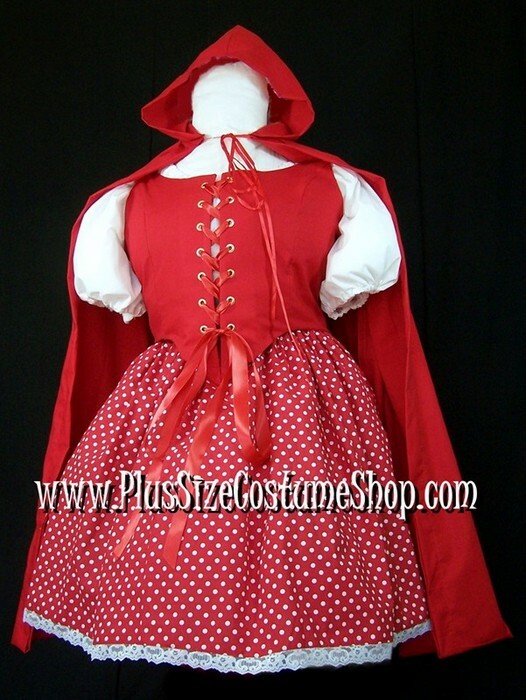 Plus Size Costume Shop carries a full line of professionally hand-made Halloween costumes, Renaissance garb, Christmas costumes and historical clothing in sizes 0X (14/16W), 1X (18/20W), 2X (22/24W), 3X (26/28W), 4X (30/32W), 5X (34/36W), 6X (38/40W), 7X (42/44W), and 8X (46/48W). Most items are available in your choice of colors. We keep most colors in stock, so there is no need to e-mail about availability. Popular color choices are shown below. You are not limited to these colors though. The bodice is made of red cotton and is fully lined and boned at the lacings. The bodice laces up through professional strength grommets. The short-sleeved peasant shirt is made of white cotton and has elastic in the sleeves and neckline for a comfortable fit. The skirt is made of red and white polka dot cotton and has an elastic waist. The skirt will be hemmed to 21” (approximately knee-length on someone of average height) unless a shorter length is requested. The skirt is trimmed in white lace. The hooded cape is also made of red cotton and ties around the neck with a red ribbon. 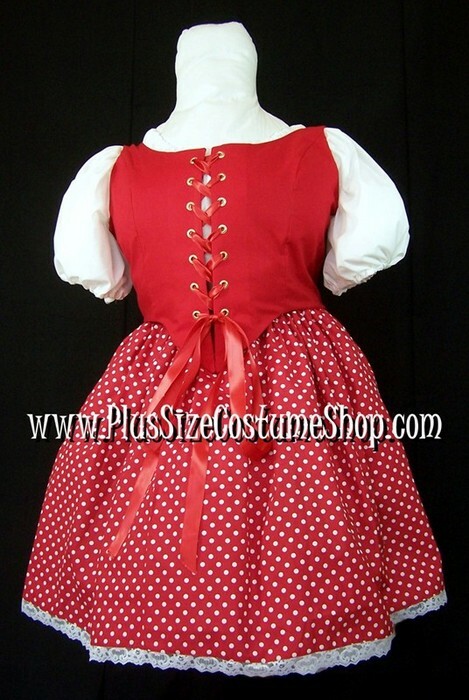 ©1999-2018 Plus Size Costume Shop, www.plussizecostumeshop.com. All Rights Reserved.